I ordered buttons off of eBay for the tuxedo blouse. It takes 19 of ’em, and they are coming from Hong Kong. I think I should have them by the end of next week. I thought about starting another needed blouse or slacks, but figured I needed to cleanse my palette with something simple. 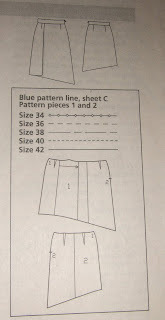 So, I’m gonna make a skirt. Now, considering I’ve made maybe 5 skirts in 15 years of sewing, this is quite the decision. I think I only made two in the last three years. I don’t generally make skirts because I don’t have tops to wear with them (do you see a pattern here?). Plus, I think only A-line works for my figure. So, Sunday was dedicated to this little ditty from 2001. I made it back in ’01, I was living in Annapolis at the time and laying fabric out in my apartment’s hallway and sewing in the dining room. Er. No zipper in the house. And, that pleat is as funky on me now as it was seven years ago. So, it will be a UFO for a bit. Maybe it needs the magic closet. 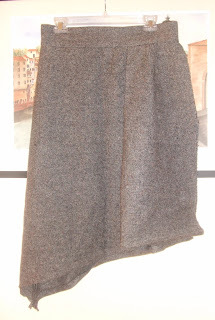 Skirt #2. 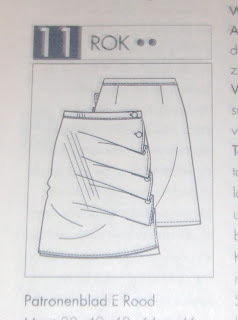 This lovely cool item from April 2008 Knip Mode. Sigrid’s already made it up and I liked it the moment she showed it. I’ve traced and laid it out. But, haven’t cut yet. It kind of needs a warm fabric that’s not too thick, otherwise it will be way bulky, eh? 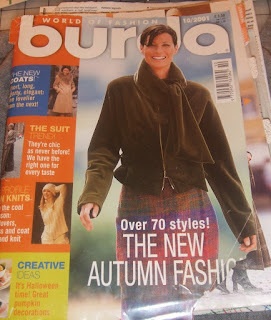 It reminds me of this skirt featured in the new Stitch magazine (ordered today). Hopefully, it will walk me through the Dutch. Right now I’m digging the contrast lining. I’ll write up a review of the magazine when it gets here.